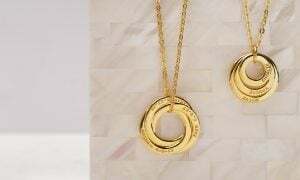 Coordinates jewelry is the kind of personalized gifts that fit every occasion, from gifts for graduates, farewell gifts for friends to anniversary and wedding gifts. 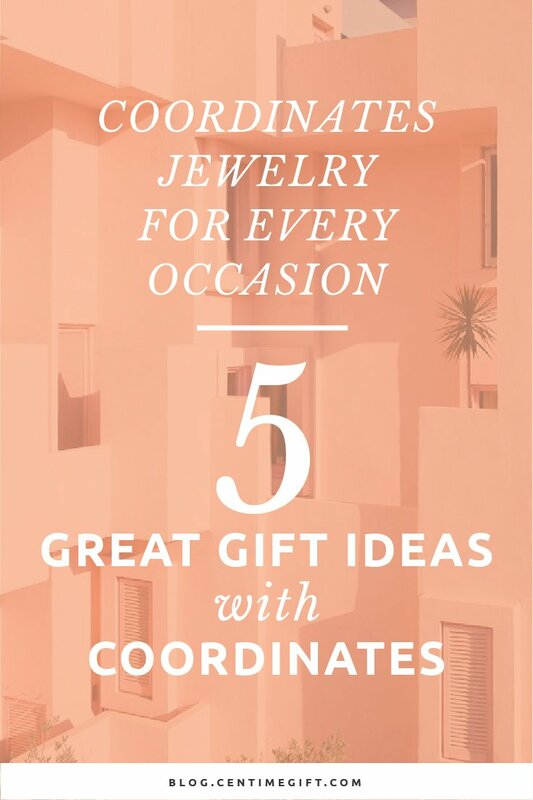 Once you understand the different ways to personalize it, you will realize how meaningful and versatile coordinates gifts can be. 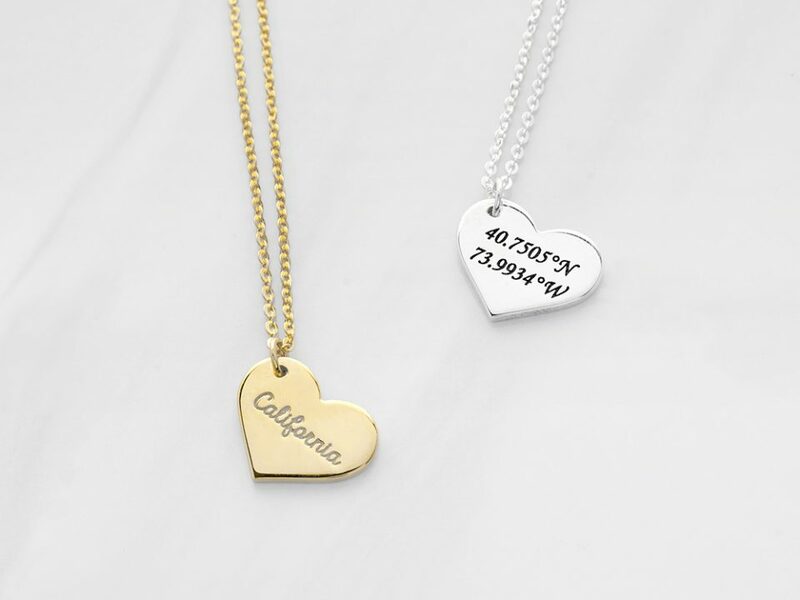 One of my favorite personalizations to recommend for customers is our Coordinates Jewelry Collection as it is a subtle, only-we-understand way to personalize a gift with the location where your special memory takes place. 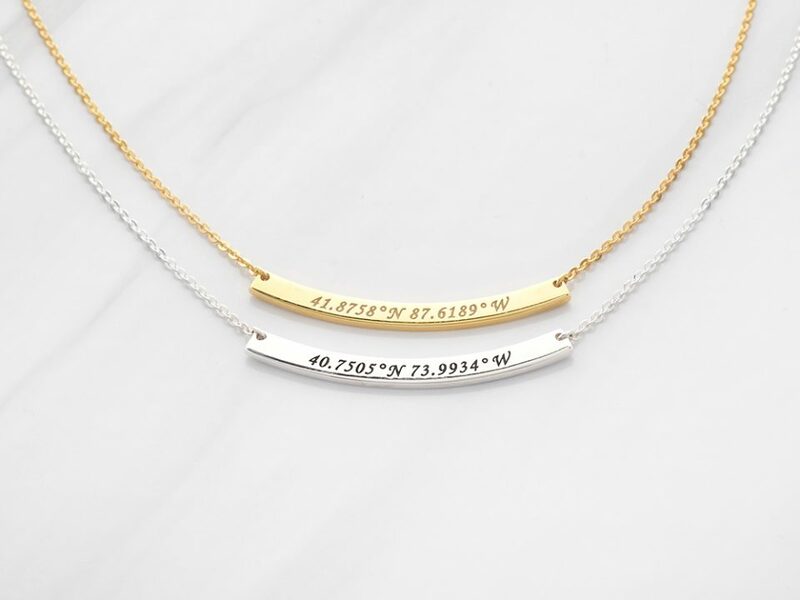 You can customize a coordinates necklace, bracelet or ring with the GPS coordinates of the location of your first date, where you graduated or first trip abroad with your BFFs. Just about every memory has a place, which is why coordinates jewelry makes a personal, meaningful gift for every occasion. 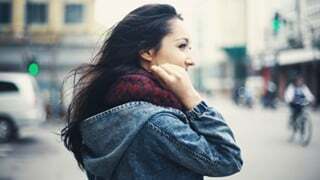 While the graduate in your family is busy wrapping up their teenage time to leave for college, you might be wrapping a high school graduation gift to send them off. 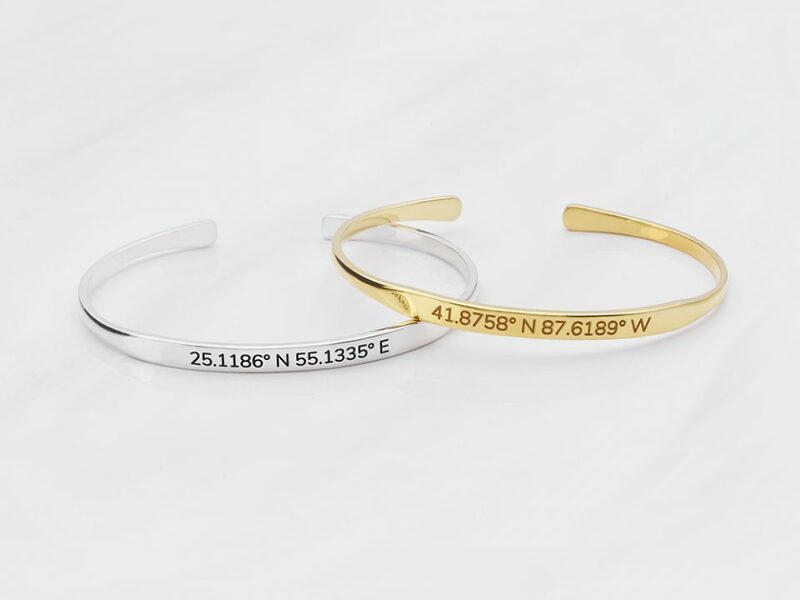 A coordinates jewelry piece personalized with the longitude and latitude of your home is a perfect reminder that they will always have a home to return to, even as time is tough as they live away from family for the first time. You can also add a message such as “never far from home” on the other side of the necklace. 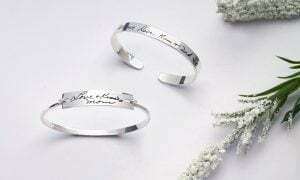 Don’t think that coordinates jewelry only makes a great graduation gift for her, any man in your family would also appreciate a reminder of home from time to time. Designed with a masculine touch, this popular Coordinates Necklace For Men is a great graduation gift for him! 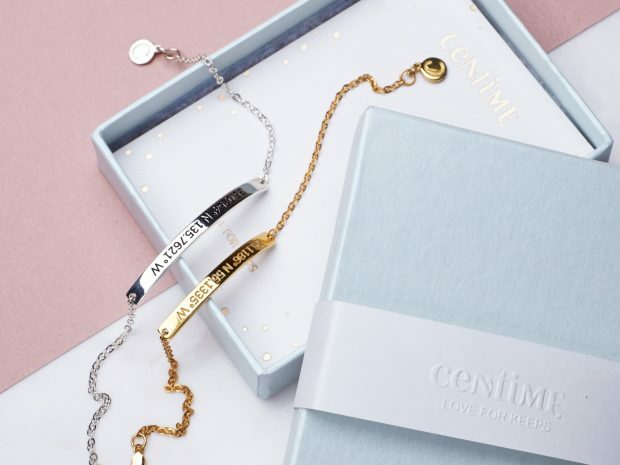 Personalized anniversary gifts is about the best (and fortunately most affordable) way you can show your partner how much you care as it requires time and effort to shop for. Engraved with the GPS coordinates of your proposal or wedding venue, a coordinates ring is a beautiful reminder of your special place of love. 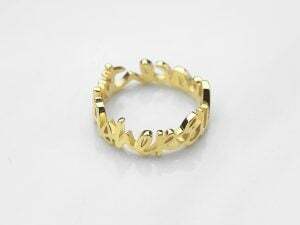 It is perfect as an alternate GPS wedding ring that your spouse can wear when they do not want to scratch or dirty their precious wedding ring. 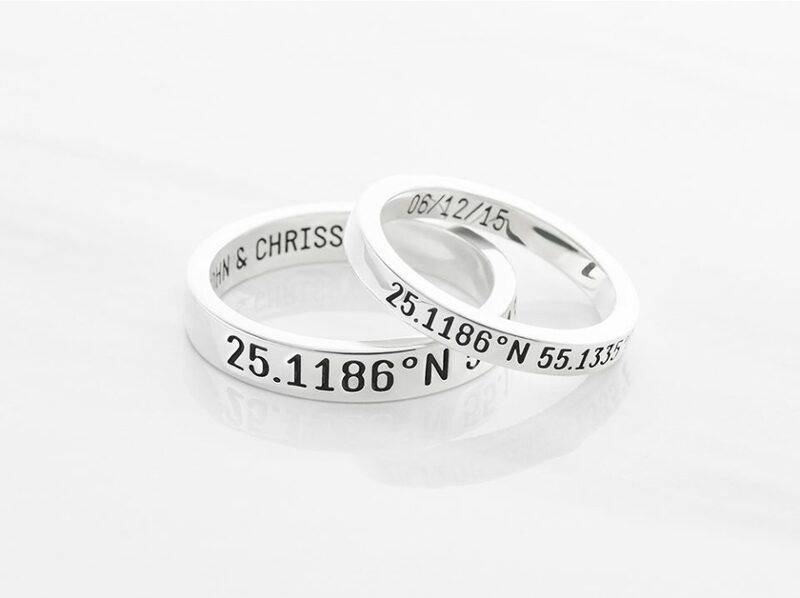 You can also engrave a pair of couple coordinates rings with the same coordinates and a message such as “our first date” on the inner side. 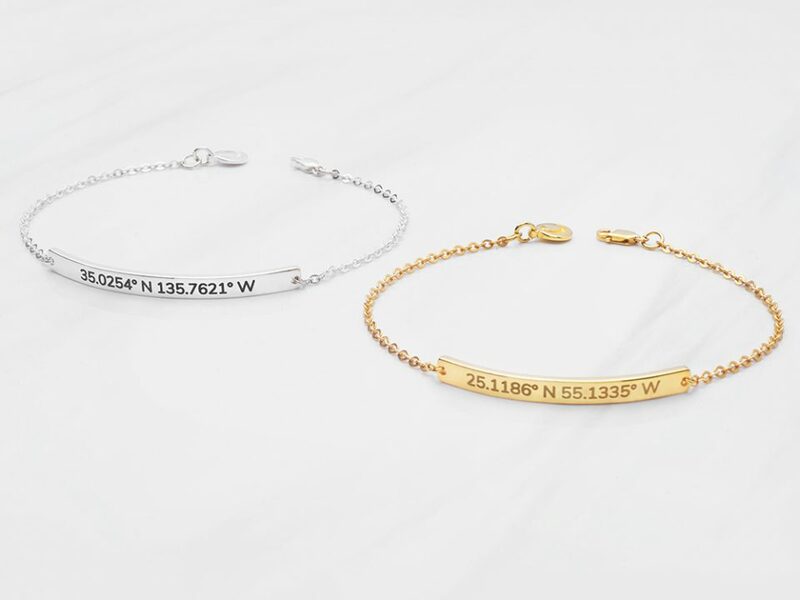 Coordinates bracelets are the new friendship bracelets. 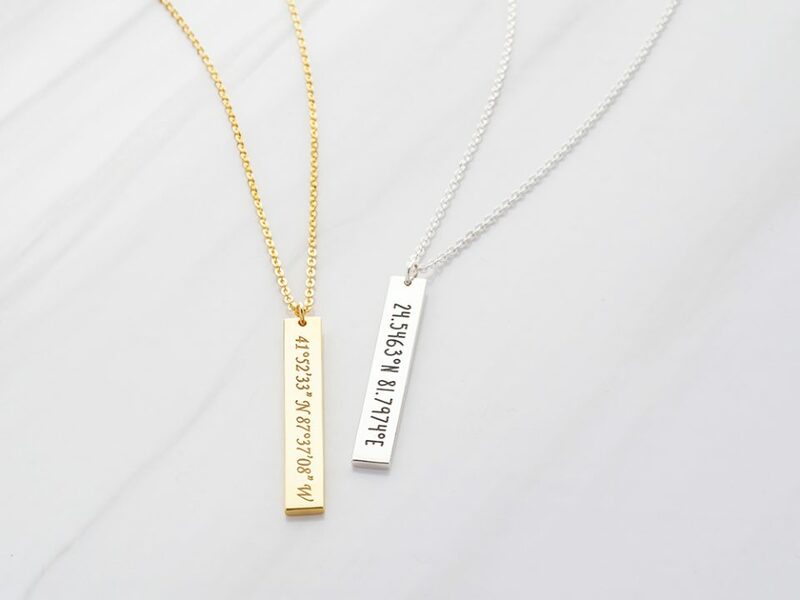 They make for the perfect personalized friendship gifts as you can simply engrave them with the coordinates of your first trip or your favourite hang out places. 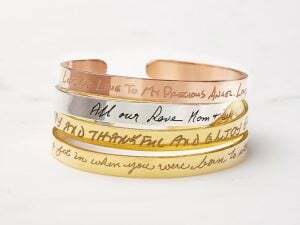 These BFF jewelry are great for any occasion, from your best friend’s birthday to graduation and farewell gift. 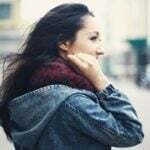 If you do not want to ruin a surprise by asking your friend for her bracelet size, coordinate necklaces are great custom best friend necklaces as well. They can be personalized with a custom message such as “River Valley High School” on the other side. Saying goodbye is hard, and finding a great farewell gifts for friends moving away can be even harder. 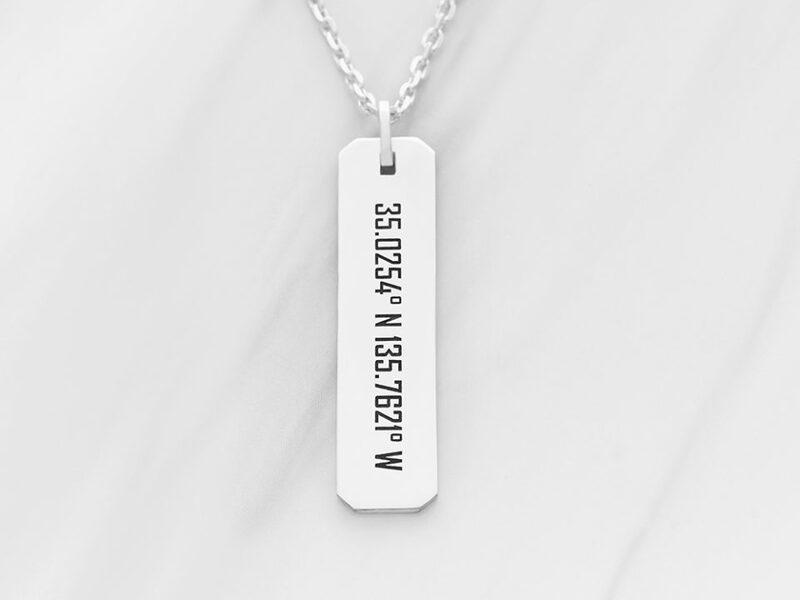 A coordinates necklace personalized with the longitude and latitude of a cafe or park you used to frequent is a great moving away gift to bid farewell. If the farewell gift is for a colleague who has hold a great deal of good memories with your company, a necklace with coordinates of your workplace address is a wonderful goodbye gift. They’ve helped you plan for your wedding, picked out a dress with you, shopped for flowers, and handmade your reception decoration. Say thank you with a thoughtful and personal bridesmaids’ gift that show how much you really appreciate your bridesmaids. 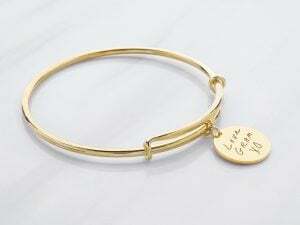 A coordinates bracelet personalized with the coordinates of your wedding venue or where you girls had a bachelorette blast is a great bridesmaid thank you gift. If you do not know all their bracelet sizes, this sweet heart coordinates necklace is a more forgiving fit that will suit anyone. 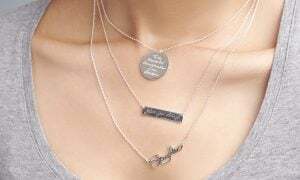 WHICH TYPE OF COORDINATES JEWELRY SHOULD I GET FOR EACH OCCASION? Whether you know the size and who the recipient is are the two most important factors that should influence your decision. 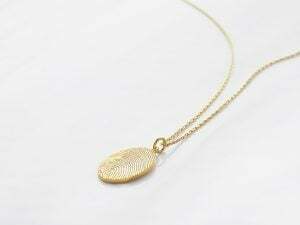 A coordinates necklace is great for when you do not know someone’s size, and it is not convenient to learn the size from a bracelet or ring that they already own. 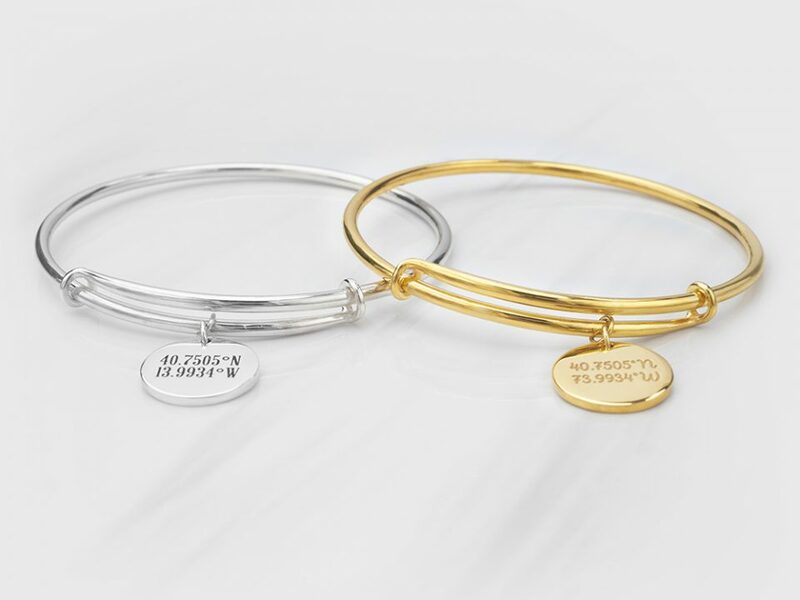 A coordinates bracelet is great for best friends, as they make for great “twinsie” bff bracelets. 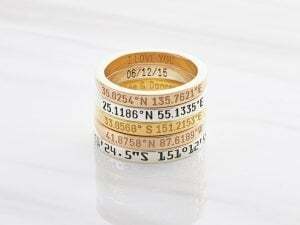 A coordinates ring always holds more special meaning to couples and spouses, and you might already know their sizes from your wedding band. If you still have any question regarding size, check out our necklace length guide, bracelet size guide and ring size guide. Love your ideas so much Ginny, thank you for the suggestion. Glad you find the ideas useful!